Hanging art can seem like an easy and rather intuitive task, until you get halfway through your gallery wall. You step back and realize some pieces are too low and despite the fact that you used the same 3 fingers to measure the distance between them, they’re all somehow unevenly spaced. Hey, it happens to the best of us. The truth is, there is a science to hanging artwork. 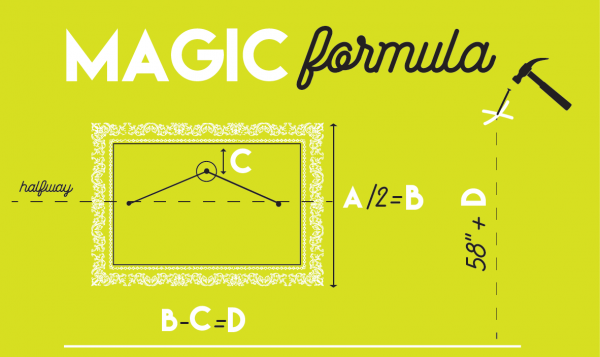 I know what you’re thinking, we got into the arts to avoid doing math…it’s ok, it’s a rather simple formula. Once you master it, you’ll be hanging artwork like bonafide museum preparator. Museums and galleries use one magic number. They center all of their artwork at 58” off the floor. This means that regardless of the size of the piece the center point should be at 58” above ground. At this height, work is at the average eye level. All work across the gallery remains constant, allowing for the energy and dialogue to flow between the work. Measure this height up from the floor, and make your mark. This is where your nail will go. You can calculate this same number for all of your pieces, if they’re hanging side by side. If you’re working on a salon wall, and will have a collage of pieces of different sizes at different heights, pick your anchor piece (usually the biggest, boldest or heaviest piece) and hang this one at 58” at center, and work your way around using a level to measure distance between pieces and ensure all pieces are straight. Now there are of course, always exceptions to the rules, such as exceptionally large pieces, or in a non-gallery space how the work will sit in relation to the room’s furnishings. Ultimately, you want to create a story and a flow with your artwork and your space. The work can be in dialogue with the colors, textures, fixtures, furnishings and bodies, so the height of the art should be where you are able to capture this flow best, it is afterall, your story.